His skimpy attire has made him an Atlantic Canada blizzard celebrity. There's an old weather proverb in Canada — "Big snow, little clothes." Actually, that's not a saying. We totally made that up. But it's an apt description of this New Brunswick man's snow removal shtick. 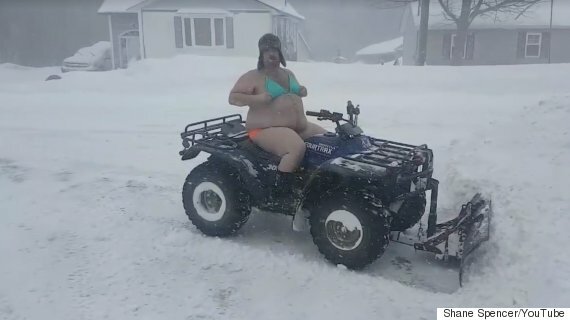 Shane Spencer, of Minto, N.B., hopped on a friend's ATV Monday, clad in nothing but a teeny-tiny Speedo, bikini top, toque and boots, to deliver a weather report while plowing a huge amount of snow. "As you can see, ladies and gentlemen, the government hasn't been doing their job," he jokes in his opening line. Spencer's been forecasting the weather in various states of undress for years, posting his hilarious reports to YouTube. But this report, made ultra-ridiculous by adding one of his wife's bikini tops, has turned him into somewhat of a Canadian celebrity. "Who wants to watch a chubby guy in a bikini on a four-wheeler pushing snow around? Apparently a lot of people do," he joked in an interview with The Huffington Post Canada. Spencer was first inspired to do weather reports after seeing the success of Cape Breton's amateur weatherman Frankie MacDonald. And when the snow started piling up in his small town on Monday afternoon, he saw the opportunity for an extra-funny forecast. "Who wants to watch a chubby guy in a bikini on a four-wheeler pushing snow around? Apparently a lot of people do." Spencer says while it was pretty cold — around -20 C with the windchill — he managed to remain outside for a half hour in his tiny attire. "We shot the video, and I wanted to do another take. My friend was like 'I think we're good, man. I think you got it.'" New Brunswick continues to dig out of a blizzard that saw upwards of 70 centimetres fall in some parts of the province. Spencer said while he's managed to dig himself free, he doesn't expect it to last for long. The area is supposed to see another storm roll in tonight, bringing with it 25-30 centimetres of snow. And while some Atlantic Canadians may see more snow as a burden, Spencer says it's just another chance for him to entertain Canadians. "I'll be making another video, and hopefully bring more smiles to more faces. That's what it's all about."